Dynamical models are widely used in systems biology to describe biological processes ranging from single cell transcription of genes to the tissue scale formation of gradients for cell guidance. One of the key issues for this class of models is the estimation of kinetic parameters from given measurement data, the so called parameter estimation. Measurement noise and the limited amount of data, give rise to uncertainty in estimates which can be captured in a probability density over the parameter space. Unfortunately, studying this probability density, using e.g. Markov chain Monte-Carlo, is often computationally demanding as it requires the repeated simulation of the underlying model. In the case of highly complex models, such as PDE models, this can render the study intractable. 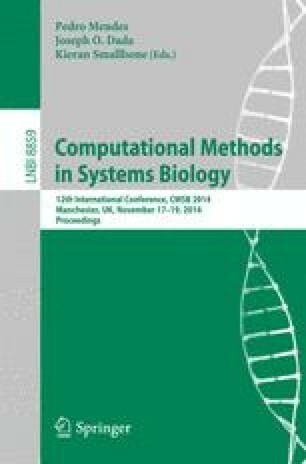 In this paper, we will present novel methods for analysis of such probability densities using networks of radial basis functions. We employed lattice generation algorithms, adaptive interacting particle sampling schemes as well as classical sampling schemes for the generation of approximation nodes coupled to the respective weighting scheme and compared their efficiency on different application examples. Our analysis showed that the novel method can yield an expected L 2 approximation error in marginals that is several orders of magnitude lower compared to classical approximations. This allows for a drastic reduction of the number of model evaluations. This facilitates the analysis of uncertainty for problems with high computational complexity. Finally, we successfully applied our method to a complex partial differential equation model for guided cell migration of dendritic cells.